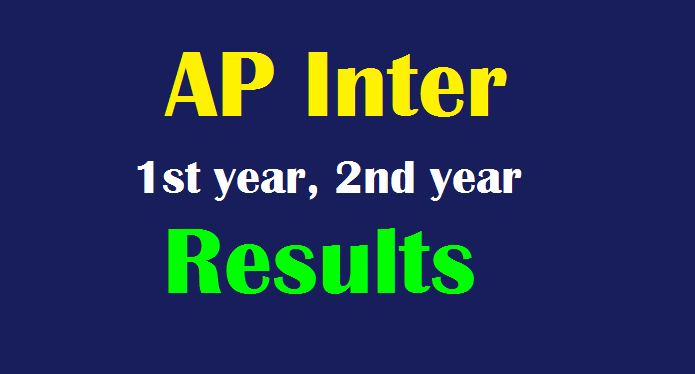 AP Inter Results 2019 : AP Inter 1st, 2nd year results to be annonced on 12 April 2019 on bieap.gov.in : AP Inter Results: AP Inter 1st, 2nd year results to be out on April 12! on bieap.gov.in: Andhra Pradesh Board of Intermediate Education, BIEAP is expected to release the AP Inter Second Year results 2019 in the second week of April, 2019. AP Inter 2nd year 2019 results will declare on April 12, 2019. AP Intermediate Second Year examination commenced on February 28, 2019 and concluded on March 18, 2019. The result will be declared on by the Board of Intermediate Education, Government of Andhra Pradesh or BSEAP on the official website bieap.gov.in. Nearly 4,36,000 students appeared for this examination. Students who appeared for the examination can check their result on the official website. ఇంటర్‌ ఫలితాలు 12న: మొదట ప్రకటించినట్లే ఏప్రిల్‌ 12న ఇంటర్మీడియట్‌ ఫలితాలు విడుదల చేసేందుకు ఇంటర్‌ విద్యామండలి చర్యలు చేపట్టింది. ప్రశ్నపత్రాల మూల్యాంకనం పూర్తికాగా.. ఫలితాల విడుదలకు కసరత్తు చేస్తున్నారు. Step 1: Visit the official website bieap.gov.in. The official notification for the results will be declared only a day before the result declaration. The dates provided by the third party website are based upon the information provided to them by the board. Last Year the result was declared on April 12, 2018. Total 4,41,359 students appeared for the examination in 2018. In 2018, the total number of passing percentage was 73.33% including 77% girls and 70% boys. Intermediate Education is a two-year duration course conducted by BIEAP. The course is also known as Higher Secondary Classes - HSC. The board currently offers 85 streams/courses which are based on subjects chosen by the students to study. BIEAP was established in 1971, to regulate and supervise the system of Intermediate education in the state of Andhra Pradesh. It specifies the courses of study and matters connected with the Intermediate education. AP is the first state in the nation which adopted 10+2+3 pattern of education. It regulates and supervises the system of Intermediate education. It is the executing and governing body for various activities such as devising of courses of study, prescribing syllabus, conducting examinations, granting affiliations to colleges, providing direction, support and leadership for all educational institutions that come under its jurisdiction.